Updated 2018: You live in the Philippines and want to earn reward miles for free flights on Philippine Airlines with the Mabuhay Miles program with your daily credit card spend? There are 13 banks offering more than 50 credit cards that allow you to earn Mabuhay Miles! You say, you have one of those already? Great, but are you sure it is the best one? The best card earns more than 12x the number of Mabuhay Miles than the worst one! Read on to find out which are the best credit cards to earn Mabuhay Miles! It is pretty shocking how different the mileage earning is from one credit card to the next – and how quickly and how drastically banks in the Philippines devalue existing cards – some of the cards in my review lost 2/3 of their value since my initial review! After digging through the details of all these cards, it is not surprising though – the banks make it really difficult to find out how much you earn or what the fees are! To make it easier for you to find the best credit card to earn Mabuhay Miles, I am comparing all the details of the cards in three groups: the best cards to apply for now, good cards to keep if you already have them and cards to avoid or cancel! Before you apply for a card, make sure to read my general advice on reward cards, read the fine print before applying, make sure you understand all the fees and pay off your credit card in full every month – or the interest will be more than any rewards you earn! The Citibank PremierMiles Visa Signature Card offers the highest earn rate of Mabuhay Miles for any type of credit card spending with 1 mile for every 30 Pesos of spend (or 1.6m/USD). That’s a great reward rate, even when compared to highly rewarding US credit cards. Even better, the ThankYou points you earn are flexible and can be redeemed for a number of airlines, including my favorite carriers Singapore Airlines, Thai Airways and local competitor Cebu Pacific (read my credit card review here). The card has a chip (important for safety and international travel). The high annual fee of P5,000 is waived for Citigold customers. The Foreign Exchange (FX) fee is very high at 3.525% making the card less interesting for international travel. One of the perks for the card include lounge access with the card! The high earn rate, flexibility of points and waveable fee make this the best all-around card to earn Mabuhay Miles with daily spend in the Philippines. There is a second, non-Signature card available that earns point at a lower rate of 1 mile per 45PHP – make sure to ask for the Signature card! PNB Mabuhay Miles World Master Card is the official card of the rewards program, with the flag carriers plane on the card design! You earn Mabuhay Miles straight up at a rate of 1 mile of every P33 – slightly less than with the Citi PremierMiles. As an upside, it is the only card with a sign-up bonus of 2,000 miles and you also get a bonus of 10,000 miles when you spend more than P100,000/year with Philippine Airlines. That more than covers the high annual fee of P6,000 (that can’t be waived). You can also get a 5% discount on select international flights when paying with the PNB card, but I wouldn’t get too excited as the eligible flights are not listed and restrictions apply. PNB increased the FX fee to 2.5%, giving up a previous advantage for international travelers! They do offer priority check-in at the airport! The good earn rate and spend bonus on PAL flights make this a great card for anybody flying frequently on PAL internationally! The Asia United Bank Platinum MasterCard is a surprising alternative in the top three from a smaller bank! It’s key feature is that it has no annual fee. It also earns flexible points at a rate of 1 point per P20. You can use them for a variety of awards – or convert them at a rate of P33 for one Mabuhay Mile, the same as the PNB card. For international spend, you earn four-times the points and pay a low FX fee of 2%, making this card great for international travel! Add the low interest rate and lounge access, and this card earns a spot in the winning trio! If you don’t meet the spend minimum to waive the Citibank fee or to earn the PAL bonus with PNB, this is the best deal for you. If you already hold another rewards credit card, this is a great card to apply to in addition without incurring another fee! Good credit cards to keep: If you are applying for a new card to earn Mabuhay Miles, I recommend you apply for one of the three winners above. But if you are already earning reward points with the cards below offered by Metrobank, Standard Chartered or Union Bank, you might want to hold on to them. While you have to spend more (40-50P per mile), the earn rates are still decent, fees are competitive and they offer various travel perks from lounge access or insurance to concierge services. It might not be worth the hassle of getting another card, paying multiple fees or having points in multiple accounts, just to earn slightly more points. BDO and RCBC drastically devalued their cards, reducing the earn rate to roughly a third of what it was before. While they are decent cards overall, that reduced value puts them on the border to the cards “to be avoided”! 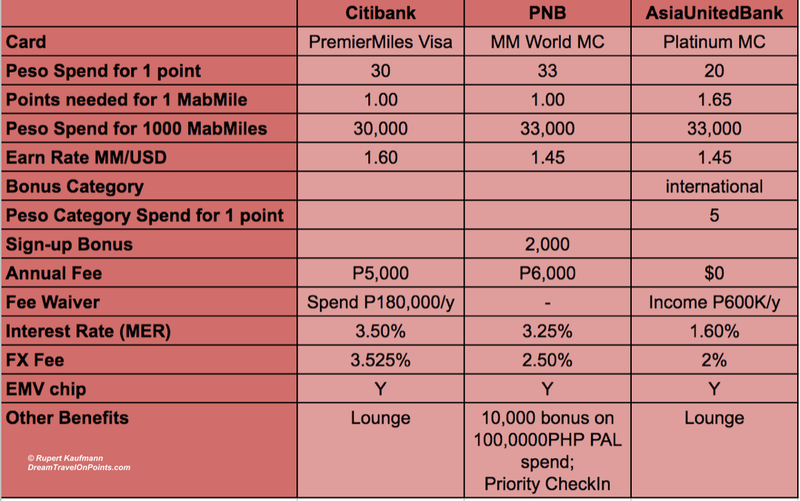 Cards to avoid: If you are applying for a card to earn Mabuhay Miles, I recommend to avoid the cards below. Some of them, like the China Bank World MC advertise great earn rates of 1 point for only P25 spend – but you’ll have to read the fine print to find out that those points are converting at a rate of 8 to 1, so you have to actually spend 200P for a single Mabuhay Mile, making them pretty much worthless! The absolute worst earning rate is on the EastWest card where you have to spend a whopping P364 for a single mile or more than 12 times what you need on the Citibank card! And you don’t even get lower annual or FX fees to justify the poor earn rates. I recommend you avoid these cards. If you already have one, I’d apply for one of the winners and cancel these losers – your hard earned money deserves better! Bottomline: Not all credit cards are created equal and banks change key features of their cards with little notice, so it pays to be vigilante. Before applying to a card, make sure to check the details on your application and ensure the card (still) meets your needs! And it pays to check before renewing your card as well, as the sad example of BDO and RCBC show! The requirements are different for each bank and each credit card. They typically include ID as proof of identity and proof of income. Check with the bank issuing the card and read the terms & conditions carefully! Please also read my tips for credit cards here. Be sure to pay your credit card bill in full every month – or your interest charges will be higher than the rewards you earn! The Citi PremierMiles now carries a higher annual fee of P5,000 (up from P2,500). There is another (non-Signature) card that earns at a lower rate of 1 mile/P45. The Asia United card now earns 4x the miles on international purchases, making it an even better deal! I wasn’t able to validate the PNB interest rate – their website is down, again… they repeatedly have problems with their technology… please check before you sign up! Very useful info. Thank you vmuch for this. Citibank doesnt offer annual fee waiver anymore. Thanks for sharing. I contacted Citibank and you are correct. The annual fee is no longer waived based on P180,000 spend. It is still waived for CitiGold customers and can be waived based on credit standing, if approved. If you had a the waiver previously, I’d recommend to reach out to your branch, representative or customer service for reconsideration. They may still do it, but may not.. I will update the post accordingly! Sharing my experience: I called Citi to ask for a waiver and was transferred to their marketing dept. who, after a lengthy discussion, told me with conviction that they no longer waive annual fees. I told them I understood and redeemed all my points. After the process, I called them again and asked to be connected to the cancellation dept. In there the person asked me if I tried to get my fees waived, I said no. They said they’ll check if they can waive the fees for me, put me on hold for 2 minutes, and then lo and behold – I was told that my annual fee would be waived. While the situation confused, irritated, and frustrated me, (redeeming the points took time and effort, I would have preferred to just accumulate them) I’m still happy that I got the annual fee waived. Thanks for sharing your success story. Citibank and other banks have “retention” departments that have the authority to wave fees to keep loyal customers. I’m glad to hear it worked out for you. For other readers, it’s always worth a try to call customer service, letting them know that the fee is too high and you are considering to cancel. If they don’t make a retention offer, you can tell them you’ll think about it – and either cancel again to talk to a different agent or transfer all your points before actually cancelling! I checked the RCBC credit card website, and there conversion rate from Airmiles points (in-house) to Mabuhay miles is now 3:1. You still earn 1 point for every 36 pesos spent, but you now need 108 pesos to earn 1 Mabuhay mile, is this correct? With BDO, to get 500 Mabuhay Miles, one must accumulate 1000 Elite points on a Platinum MC/Visa. 40 pesos = 1 Elite point, thus to get the 500 Mabuhay Miles, 40,000 pesos must be spent. Hi Terrence, thanks for the update. You are correct, BDO has changed the redemption rate and you now need 2 Elite Points for 1 Mabuhay Mile. That’s a devaluation of 100% and makes the BDO Platinum card much less attractive to earn Mabuhay Miles. I will correct the table in the next update! Terrence, you are correct again! RCBC has also devalued their points, even more so than BDO. It has reduced the Mabuhay Miles earning from 1:1 to 3:1. That puts the RCBC Infinite card into the “to be avoided” list. I’m shocked and saddened to see how drastically the banks are devaluing their cards. I’m glad consumers like you are vigilante to make sure they get the best value! Hi there. You hvent mention bpi credit cards. Is it a good card or not so much? Thank you. I don’t recommend the BPI Gold card to earn Mabuhay Miles due to the low earn ratio and the high fees. You can see it in the last table at the bottom of this article. The Citi PremierMiles card earns 6x as many miles per Peso spent as the BPI Gold card! I recommend Metrobank Travel Platinum Visa. You earn P17=1mile for airline purchases,hotels and purchases abroad. Miles are convertible to Mabuhay Miles, Asia Miles and Krisflyer. Though the foreign conversion rate is higher than my Citibank. Still it’s worth it if you just want the miles. Oh, it comes with a free Priority Pass Membership Card. The Metrobank Travel does earn a higher rate of points on foreign spend – but only on airline tickets (which you probably buy at home) and hotels, not restaurants, sights or shopping! And it also uses their own conversion rate for foreign transactions of key currencies instead of the Visa/MC rates other banks use and charges a 2.5% FX fee on top! Lastly, similar to other cards, the Metrobank Travel card, requires you to redeem 2.5 reward points for 1 airline mile, so the actual reward rate is much lower than the headline rate! Together, that’s a lot more fees and less rewards than it sounds at first! And you can convert to miles only every 10,000 reward points which is equivalent to 4,000 miles which you can choose to convert to Mabuhay Miles, Asia Miles or Krisflyer Miles. Hey R, you’ll probably want to move the PNB World Mastercard down to the “cards to keep” category. Starting August 8, 2018, it will only earn 1 Mabuhay Mile every 40 Peso spend. It’ll retain its 1 Mabuhay Mile/P33 spend on international transactions but it’s a bad deal given how high its FX fee is. Thanks for sharing that info – travel credit card benefits in the Philippines are falling faster than I can update this post! This change puts the earn rate of the PNB card level with the Standard Charted card at 1.2%, but ahead of the other “cards to keep”. I will review and update! Thanks for the update, that makes it harder to get the fee waiver!